If you don’t have more than one server, just go into your ConfigurationManager in windows and add a few alias’ in that point to your local instance (that’s what I did…). Make sure to add them to both the 32-bit and 64-bit Sql Native Client alias’. The ‘%’ is an alias for ‘foreach-object’ for the list of servers in the text file. The ‘$_’ is just a reference to the current item in the list of servers in the text file. 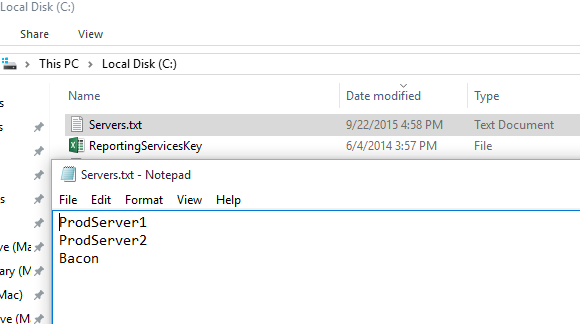 Use Get-Content to retrieve the contents of our c:\Servers.txt file. Iterate through the servers in the file, each time changing the server name ($_) in the ServerConnection object. Even though I’m using a ServerConnection object to connect via the Server object, you don’t have to do this. You can just as easily pass the servername string into the Server object and it will work just fine. In upcoming posts, we’ll go through examples of adminstering the most common objects that hang off the Server object. For the 3rd post, we’re going to look at retrieving data from Sql Server. It’s not much more complicated than the second post, but it does involve some new objects. This does a while loop on the SqlDataReaders’ Read() method, which will return $true as long as there are records to be read. While using the SqlDataReader is fast and efficient, it’s not the most user-friendly object to use for reading data in powershell. For ease of use, you can’t beat a DataTable. The –Force will overwrite the file if it already exists. The –NoTypeInformation does what it says, it omits type information from the file. If you don’t specify this, you’ll see extra type information output into the csv file that you probably don’t want. The first post consisted of getting the powershell cmdlets installed/imported into your powershell environment (in my case, powershell_ise). For day 2, we’re going to look at how we can connect to a Sql Server instance. The serverconnection is just what it sounds like; a connection to your sql server instance. In the code below, all we’re doing is importing the SqlPS module, then creating a ServerConnection object and passing in the name of the server instance that we want to connect to, then opening said connection. I’ll explain a couple of the details the details here. The Push-Location at the beginning of the code is used to store your current location, and the Pop-Location at the end just returns you to that location when we’re done running this code. You don’t NEED to do this, but the Import-Module SqlPS will switch you to the SQLSERVER drive, which can then interfere with other cmdlets you may be running. It’s just a good habit to get into when using the SqlPS provider, sadly not one I’ve consistently formed. So, what is this error really telling me? All I know is that it failed to connect, not what the problem really was. Is my server name incorrect? Was my password incorrect? I can see that the issue was that the login was indeed incorrect. Okay, now that that is all explained, let’s get back to the ServerConnection object. If you want to use AD authentication with the ServerConnection object, there is a property named LoginSecure that will set this. It is true by default, so to use AD auth, just open the connection on the ServerConnection object and it will use it by default. If you want to use Sql Server authentication, you have to set a few more properties. There is also another property on the ServerConnection object named SecurePassword. This property exists so you can encrypt your passwords via a secure string (most likely held in a file) and use that to more securely handle passwords. This same type of scenario also exists for the ConnectionString property & SecureConnectionString property. 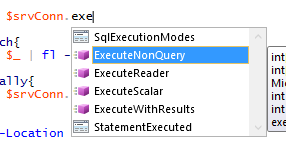 The most common methods for this object are the Execute* properties for executing various types of Sql statements. Essentially, what this is doing is for 1 to 1000 (1..1000) execute the ExecuteNonQuery method and insert the current number ($_) into the ID column and insert ‘Test_[current number]’ into the Value column. Now, this 1..1000 could be values read from a file, read from another database, a custom psobject, you get the idea. For the next post, we’ll look at getting data out of a database. This isn’t a 31 days series, as I’ll undoubtedly miss a day here and there, so instead, this will just be a ’31 posts’ series instead. I’m pragmatic. And lazy. 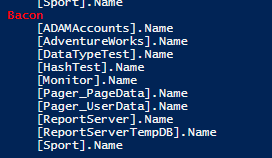 I have noticed there is a bit of discomfort amongst most database administrators when it comes to dealing with powershell. Do yourself a favor and learn it. You’ll wonder how you ever got by without it before. So here we go with post 1. A word of warning; this module loads extremely slow. This has been fixed in Sql Server 2016, but as noted in the closing notes of this post, that requires that SSMS for Sql Server 2016 be installed. Once you have all three of these installed and restart your powershell environment, you should be able to run the Import-Module SqlPS command correctly. Okay, post 1 complete. Sort of. As of Sql Server 2016, the SqlPS module is being replaced by a new SqlServer module, but that requires that the Sql Server 2016 SSMS must be installed to use it (at the time of this writing), so we’re just going to plod along using SqlPS for now. 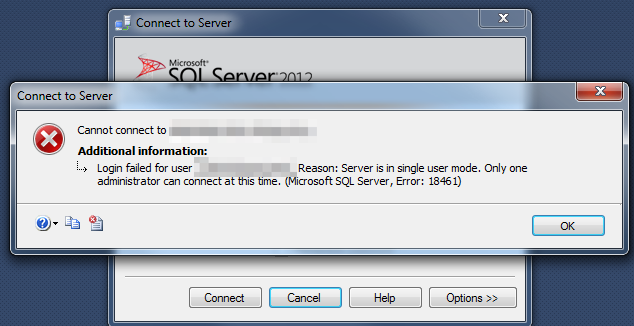 Most of the functionality provided in the SqlServer module will still work. To change the IP address in sql servers’ configuration manager, you can use the following code. Of note, when I changed the IP address in configuration manager under IP1 manually and tested connections, it really didn’t make a lick of difference. I could connect whether or not the IP1 value reflected the correct IP address or not. But, having a different IP listed in the configuration manager as opposed to what it really is just feels dishonest. I have a previous post about syncing users and logins via powershell, but seeing as that one uses the soon to be deprecated (if not already…no listing for this proc for sql server 2014 on MSDN…) ‘sp_change_users_login’, I thought I’d re-do it to be current. Use at your own risk. Keep in mind, a database login can indeed be set to use a different server login, so just bear that in mind if you find this not syncing all of them. I don’t do that (and can’t imagine why anyone would want to make their lives more complicated by doing so…. ), so I’ve not coded for that scenario. This also looks for system logins with ‘##’ at the beginning and just skips those.